You are amazing my dear SG friends! It is amazing dear SG friends. Milkman and his sad story. Brtnick and his bear song. MJardin and his fiction character. You are really good, I apologize the other, which I forget noticed. So it would be longer, its why I prepare all long page. But everyone of you was great, there are some interesting strips which you must watch. Gratz to everybody who has participated! Gratz to all the winners and participants! 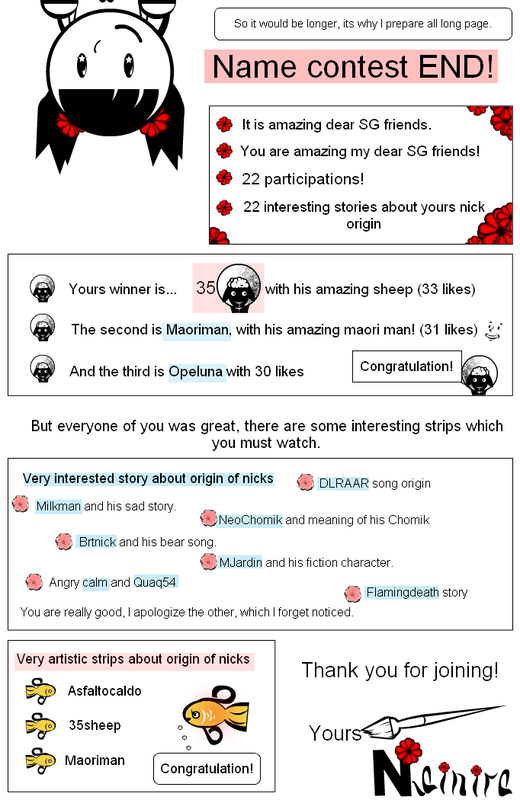 a brilliant strip ending a brilliant contest, that offered us the opportunity to reveal something of ourselves and get to know interesting stories about one another. you got my vote as FA for next week also for this reason. thank you and conga to all winners, it was lovely to join in! This is such a cute strip to celebrate the winning entries. Congrats on hosting a very successful contest. ~ It was fun for all!